Shipping Methods are company specific and are used to define all the possible shipping options a company uses to deliver goods to customers or receive goods from vendors. During the Dynamics GP installation a default list of shipping methods can be installed. Payment Terms are company specific and define the terms offered to customers and available from vendors for payment of invoices. Default payment terms can be loaded during the Dynamics GP installation and can be changed or added to as needed. If your company has a large list of available payment terms, you may want to identify them ahead of time so that they can be created during the implementation. Payment terms, when set up for customers and vendors, will default on all transactions and automatically calculate due dates, making transaction entry faster and more accurate. Credit Cards can be set up in Dynamics GP to be used for payment to vendors and to be accepted as payment from customers. Bank Card / Checkbook ID: This will associate a credit card with a bank account (also called Checkbook) in Dynamics GP. When a customer payment is entered using this type of credit card, the payment amount will automatically go to the bank account specified. This setup option is typically used when the full amount of the credit card charge is deposited into the company's bank account by the credit card processor, and the credit card processing fees are taken out separately on a monthly basis. Charge Card / Account Number: This will link the credit card to a General Ledger account. When a customer payment is entered using this type of credit card, the payment amount will be posted as a debit to the GL account specified, and will require a separate entry to move the payment out of this GL account into the cash account. This type of credit card setup is useful when the credit card processor takes their discount or fees out of every transaction. For example, a customer pays $500 with a credit card, but only $487.50 is deposited into the bank account with a $12.50 fee deducted right away. Credit Card / Vendor ID: This will associate a credit card with a vendor in Dynamics GP. When a vendor payment is entered using this type of credit card, the payment amount will automatically create an invoice payable to the credit card Vendor ID specified. This setup option should be used for traditional credit card accounts that send a monthly statement to be paid separately. 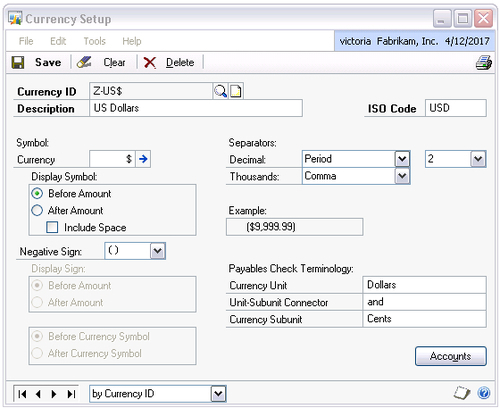 Check Card / Checkbook ID: This option will link the credit card to a bank account (Checkbook) in Dynamics GP. When a vendor payment is entered using this type of credit card, the amount will be posted as a cash withdrawal from the Checkbook specified. This credit card setup is used for what is commonly called Debit Cards, where each purchase is deducted from the bank account right away. Credit card setup is company specific in Dynamics GP. Multiple companies cannot share credit cards. W﻿ith very few exceptions, all transactions in every subledger will be set to Post to General Ledger. This will create GL entries after the subledger posting is completed. Choosing the Post Through General Ledger Files setting will automatically post the resulting GL entries at the time of the subledger posting. If this setting is not chosen, a user will need to post the GL entries that have been created from subledger postings as a separate step. Many companies, when first starting to use Dynamics GP, decide not to have transactions automatically posted through to the GL. This gives them the chance to examine the General Ledger entries created and make sure they understand how the system is behaving with regard to dates and account numbers defaulted. However, as it takes less time and work to have transactions automatically posted through to the GL, eventually many transaction types are changed to use the Post Through General Ledger Files option. 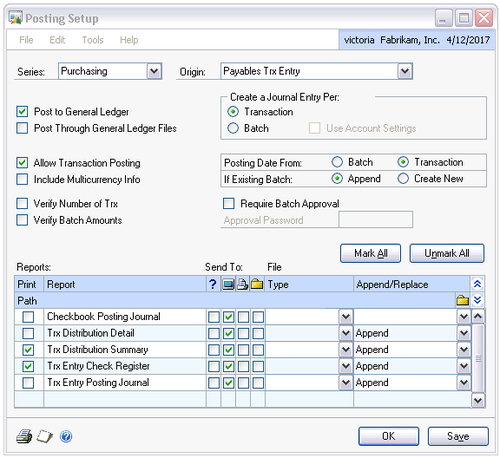 When posting a subledger batch with multiple transactions, the Create a Journal Entry Per setting determines whether a General Ledger entry is created for each individual subledger transaction, or whether one GL entry is created summarizing the entire subledger batch. Choosing to create one GL entry per subledger Transaction allows for greater drill-back capability. When looking at a particular General Ledger entry it is possible to drill back down to the originating transaction in the subledger. The benefit of choosing to create one GL entry per subledger Batch is that the GL does not get as cluttered up with individual transactions. Consider a company that has 500 sales invoices a day. If each of these creates a GL entry, in a 260 workday year, that will result in 130,000 GL entries, just from the sales invoices. Many sales invoices will have numerous GL distributions, so with an average of 8 GL distributions per invoice, that will become 1,040,000 lines in the GL per year from sales invoices alone. Typically this much detail is not needed, as no one will be looking through it at this detail level. In this scenario, if those 500 invoices are split into five batches per day, then only five GL entries are created each day, resulting in 1,300 GL entries per year for sales invoices. To determine the right approach, consider the volume expected for each type of transaction. If there is any question, the recommendation is to err on the side of having more detail and creating a GL entry per transaction. It is much easier to summarize detailed data with reports than to recreate detail not kept from summaries. This setting can always be changed in the future as transaction volume increases. E﻿very subledger transaction in Dynamics GP will have two dates: a subledger date and a General Ledger date. The subledger date is typically the actual date on an invoice received from a vendor or sent to a customer. The General Ledger date is the date a transaction will show up on financial statements. Dynamics GP easily allows these two dates to be different and keeps track of all the dates throughout the accounting process. Reports that are printed will usually have an option for selecting transactions using the subledger date (also referred to as Document Date) or the GL date (also referred to as the Posting Date or GL Posting Date). 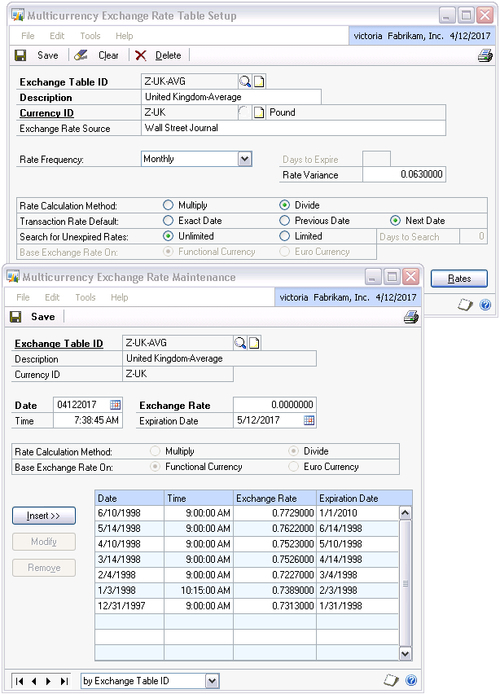 For example, a company may need to print two different Receivables Historical Aged Trial Balance reports: one using the subledger dates, which are actual invoice dates, to see the true aging of customer accounts, and another using the GL dates to reconcile the Receivables subledger to the General Ledger. T﻿he two choices for the Posting Date From setting are Batch and Transaction. Choosing Batch means that all transactions entered in the same batch will be posted with the same GL date, set at the batch level. Choosing Transaction will allow each transaction within a batch to have its own GL date. If Create a Journal Entry per Batch is selected, this option will be grayed out and automatically set to Batch. As dates are critical to keeping accounting records accurate, this setting should be considered carefully and may need to be different for different types of transactions, depending on how they are entered or imported into Dynamics GP. The more commonly seen recommendation is to set the Posting Date From option to Transaction to allow for greater control during transaction entry. For certain types of transactions it may be helpful to prevent users from posting their transaction batches until someone else has reviewed and approved them. In many companies this is accomplished with training and there is no need to have Dynamics GP enforce this behavior. However, if desired, the Require Batch Approval setting in Dynamics GP will ensure that a batch cannot be posted without an Approval Password. If you have decided to use the Multicurrency module, currencies and exchange rate tables should be planned out.